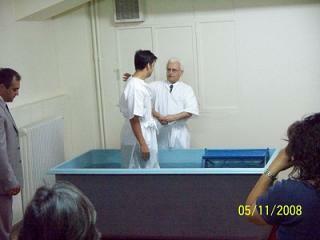 On Sunday May 11, 2008, we had the joy to see Alekos, a young man born and brought up in the Evangelical Baptist Church, now a student of the Polytechnic, follow the Lord in baptism, after his profession of Christ as his personal Savior. The baptism was performed by immersion, in the name of the Father and of the Son and of the Holy Ghost, according to the Great Commission. It followed the regular Sunday Evening service, in which along all else, Bro. Markos Boussios, Pastor, brought a message on scriptural baptism based on the doctrine of the New Testament. Hymns and prayers went up to the throne of grace from hearts full of gratitude and joy. It was indeed a blessed occasion, after which brothers and sisters, saluted Alekos in Christian love, assuring him of their prayers and wishing him God's blessing and guidance in his new life.